Tennessee Loveless Signed and Numbered Serigraph on Canvas: "8-Bit Block Mickey (Green)"
About The Artist: Tennessee Loveless is a Los Angeles based contemporary pop artist whose bold use of color and pattern evokes an immediate visual impact to the viewer, but also creates a poetic irony when one considers the fact that Loveless has limited achromatopsia colorblindness (almost complete colorblindness). Despite many obstacles throughout his life and career he has persevered in pursuing his career as an artist. He is driven by his passion for painting people and iconic fictional characters in a way that strikes an emotional and nostalgic connection through the power of the one thing he is blind to. 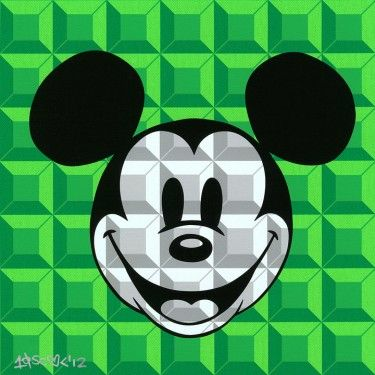 His new collection from Disney Fine Art explores his interest in high color and pattern saturated concepts. His primary focus at the moment is classic characters from the era of 1928 - 1945, Disney Villains, and Alice in Wonderland. Outside of his collaboration with Disney, Tennessee paints portraits of West Coast drag, cabaret, and celebrity personalities. As a child growing up in Marietta, Georgia, Tennessee watched his peers identify and collect information based on this "invisible force" that people called color. He began to work within two worlds, one that operated within his own vision and perception and the other which he created in his attempts to relate to the rest of the world. This disconnect later ruptured a fascination with the unknown and he began to feverishly occupy his mind with the fundamental understanding of a chromatic world. Tennessee's inability to distinguish most hues has never swayed him from creating art. If any thing, his disconnect from this in his early years made him obsessed with the forming of patterns, objects and shapes. He became attracted to the destruction of white space and became captivated with the idea of filling anything lacking in form with pattern. Later in life, he began attaching color to his subjects as he learned in color theory books which hues complimented or contrasted each other appropriately. He also communicates hue choices through an objective and synesthetic nature. The essence of his work is largely dedicated to the emotional pull and story telling element of color, expression, and pattern, and mostly importantly, the crossing of the senses. Q: How did you first learn of your colorblindness? A: "They initially discovered that I was colorblind around preschool/kindergarten in where we were doing color exercises. The room was split into 4 colors by the carpet, and in each sector of the room that was governed by the color held a different activity. When the teacher asked the students to run to that particular area, I watched as all my peers ran to this invisible presence that I had no idea about. As far as I had known, a color was just another adjective to describe an object, but as a child, these descriptors were just components of early speech and not held as something relatable (as in a 'metal stop sign' and a 'red stop sign' were just components of the word itself, and not a fact). When I was told to run to a certain area, I began to panic as I realized that people could see something that was not there to me. I ended up just sitting in the middle of the room hoping to get it right and that no one would notice." Q: How has colorblindness helped or hindered your life as an artist? A: "Colorblindness never really hindered me throughout my life until I decided to study studio painting in college. I don't think I took into account that I would actually have to really understand color to receive an acceptable grade for painting something to its exact representation. My choices of color were always based on 1. the colors I could see and 2. the colors that I felt were most appropriate. My compositions would come out in bright neon colors that were considered too blinding to be realistic, when in all actuality through my eyes were quite normal. In the end I was told that I had a decent form, but that my color choices were obnoxious and loud, and that I my art couldn't be commercially successful based on the judgment that my colors were 'eye searing'. I took up fashion sketching instead and graduated in fashion design with a double major in business/marketing." Q: There was a period during your education when you took a break from art. How did your life as a painter re-emerge for you? A: "In 2003, I eventually started painting again when I lived in San Francisco and a cabaret performer asked me to paint them. I had mentioned my previous critique in college that I couldn't represent people accurately, to which they replied "so what". I took that phrase 'so what' very seriously and began to start a collection based on the cabaret performers in my own way. I also simultaneously started reading up on color theory books and pigment compositions and began to form a world based on color codes and how they represented each other. My education in the fundamentals of pigments became more scientific than emotional, safe, and/or exploratory, and then my world of color began to spread and become more complex." Q: As a person who sees color in way much differently than most people, how have you managed to relate to color in a way that is akin to how your audience sees it? A: "Because I cannot see color accurately, and because its form is congenital limited achromatopsia, my view of how color is seen is transformed into how things taste. I communicate a feeling based of the taste of things. For example, "BubbleGum Lemonade Minnie" is based on a feeling on how I think color tastes. The violet-blues are represented what frozen blackberries taste like to me, intermixed with a frosting like taste of cake which is represented by the pink. And it all is contrasted by a sharp shocking acidic tart like fluorescent yellow/chartreuse which lines against the canvas. These color choices to me taste like a cold refreshing Summertime dessert on a hot and humid afternoon."